Account-based marketing (ABM) is a combination of people, processes, and technology that, if deployed intelligently, will complement existing marketing programs to close bigger deals more efficiently. 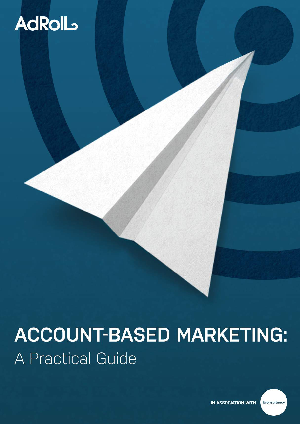 Account-Based Marketing: A Practical Guide is your manual to achieving that alignment and running efficient ABM. How to set goals and objectives? How to select target accounts and specific roles? How to create a compelling buyer journey and, in turn, align content around it? We’ll then show you, step by step, how to roll out ABM campaigns and, critically, how to structure your CRM and marketing platforms around them. As a performance marketing platform that allows you to collect, analyze, and act on your data at scale, AdRoll is uniquely positioned to demonstrate how you can achieve this. So, if your company depends on closing long-cycle, multi-stakeholder deals and measurably scaling that activity, then this is the “toolkit” for you.